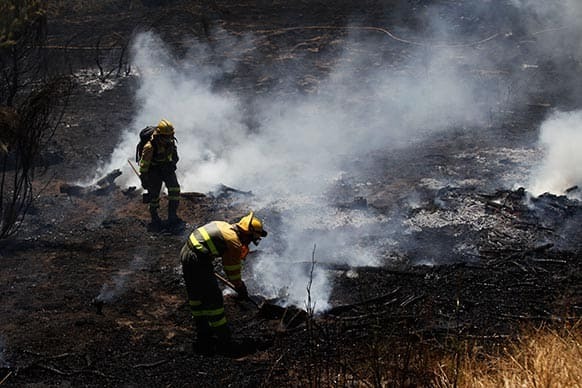 Firefighters work to control the fire outskirts of Cebreros, Spain. Actors Stuart Townsend (L) and Hannah Ware attend the Disney/ABC Television Group`s 2013 Summer TCA panel at the Beverly Hilton Hotel in Beverly Hills, Calif. 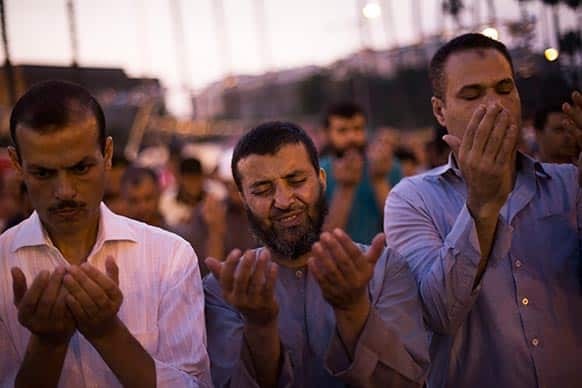 Supporters of Egypt`s ousted President Mohammed Morsi pray after "Iftar" during a protest near Cairo University in Giza, Egypt. A model displays a creation by designer Gaurav Gupta during the Delhi Couture Week in New Delhi. Magdalena Rybarikova, from Slovakia, celebrates after a point during a finals match against Andrea Petkovic, from Germany, at the Citi Open tennis tournament. Bollywood actors Sonakshi Sinha, left and Akshay Kumar pose after they walk the ramp on the first day of the India International Jewelry Week (IIJW) in Mumbai. 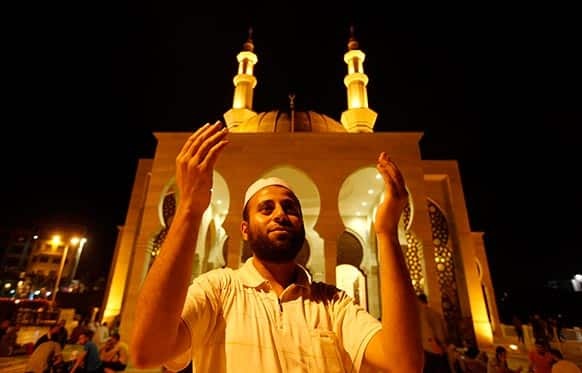 A Palestinian man prays during Laylat Al Qadr prayers on the 27th day of the holy fasting month of Ramadan outside the beach mosque in Gaza City. 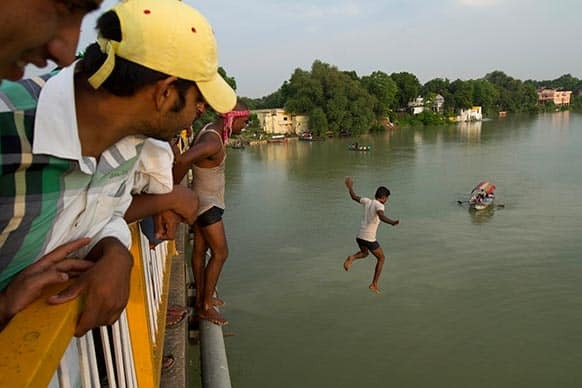 A man jumps to swim from a bridge across the River Ganges which is flooded after heavy monsoon rains in Allahabad. 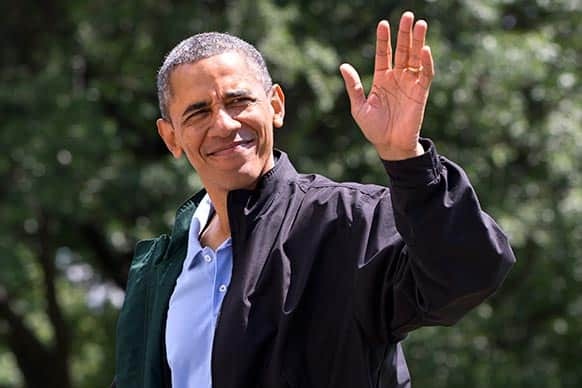 President Barack Obama waves to the media as he walks on the South Lawn of the White House in Washington after returning on Marine One from Camp David, Md., where he spent his birthday. 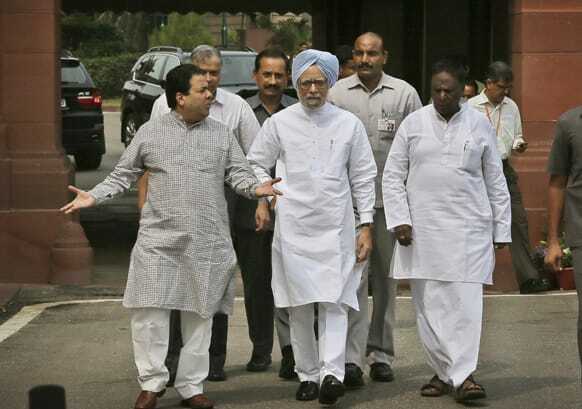 Prime Minister Manmohan Singh, talks to his cabinet members as they walk towards media after his arrival at the opening day of the monsoon session of the parliament, in New Delhi. 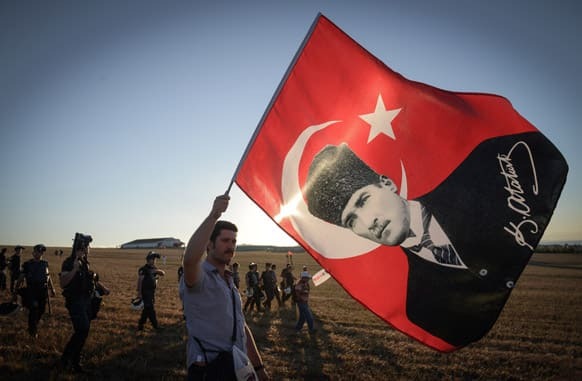 A man walks with a national flag with an image of Turkey`s founder Kemal Ataturk outside the Silivri jail complex outside the Silivri jail complex in Silivri, Turkey. 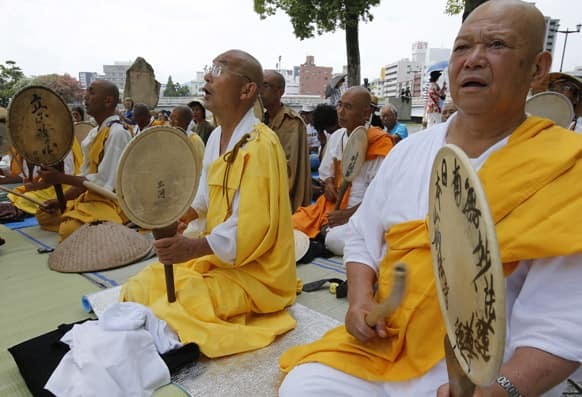 Buddhist monks chant a Buddhist mantra while beating drums in front of the Atomic Bomb Dome in Hiroshima, western Japan. 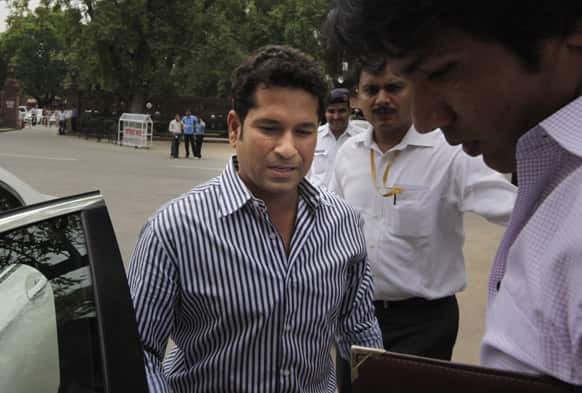 Cricketer and members of parliament Sachin Tendulkar, arrives at the parliament house on the opening day of monsoon session, in New Delhi. 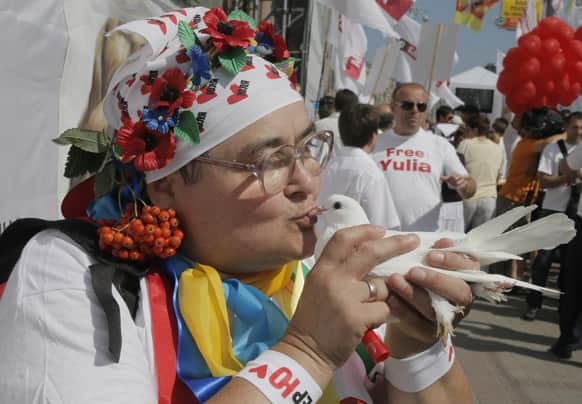 A supporter of former Ukrainian Prime Minister Yulia Tymoshenko kisses a white bird as a symbol of protest during a rally in a tent camp in central Kiev, Ukraine. 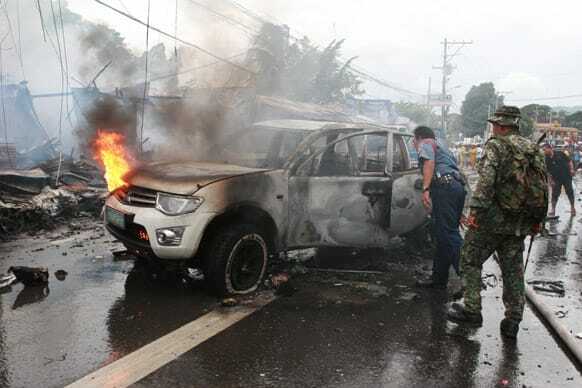 Police and military personnel inspect a burnt vehicle after a powerful bomb exploded in Cotabato city, southern Philippines. 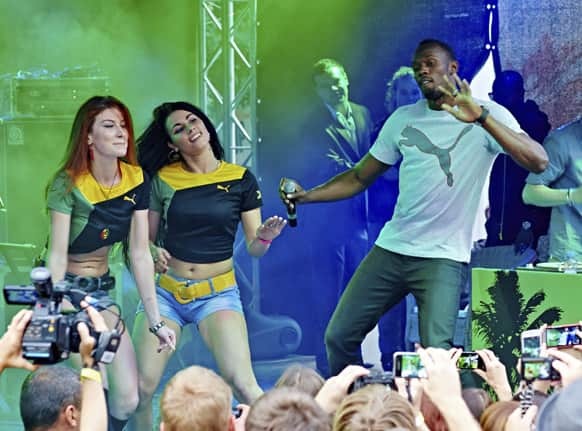 Usain Bolt of Jamaica, right, entertains fans during the PUMA Jamaica Party after his arrival in Moscow at Puma Social Club in the Gorky Park. 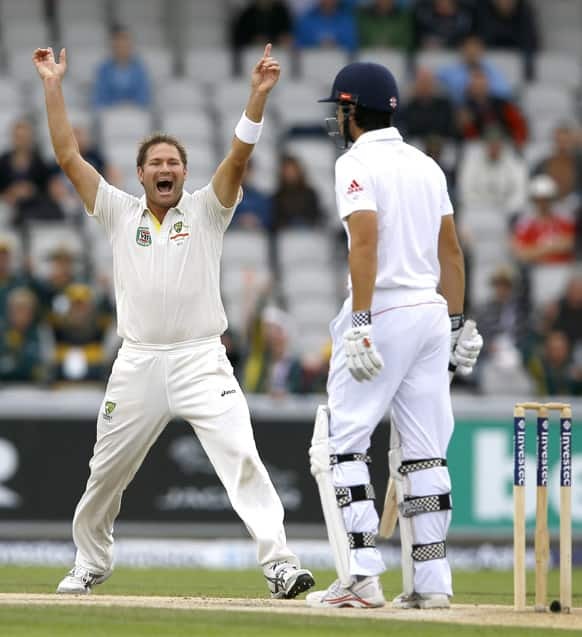 Australia`s Ryan Harris, celebrates the wicket of England`s captain Alastair Cook, right, during day five of the third Ashes Test match held at Old Trafford cricket ground in Manchester, England. 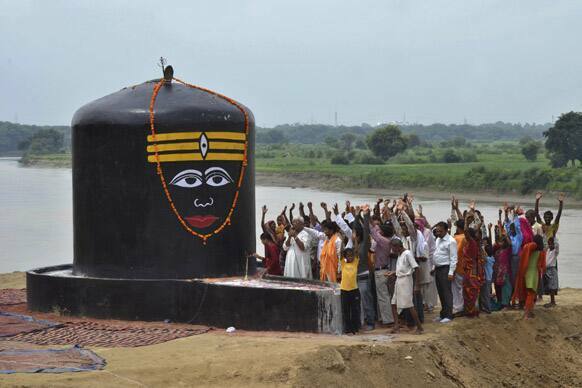 Devotees raise their hands and chant religious slogans as they worship newly installed "lingam", representing Hindu deity Shiva on the banks of the river Yamuna in Agra. Models display creations on the second day of the India International Jewelry Week in Mumbai. 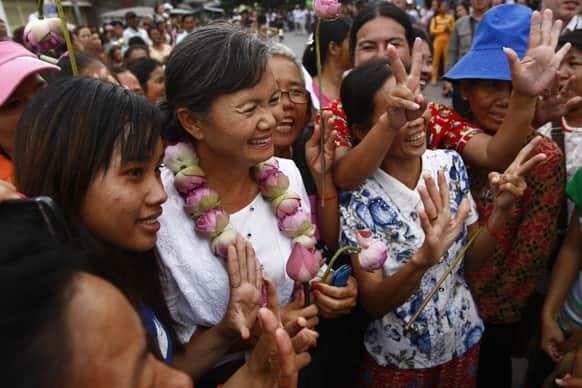 A Lawmaker of National Rescue Party Mu Sochua, center, poses for photographs with villagers during her visit to Boeung Kak lake, in Phnom Penh, Cambodia.